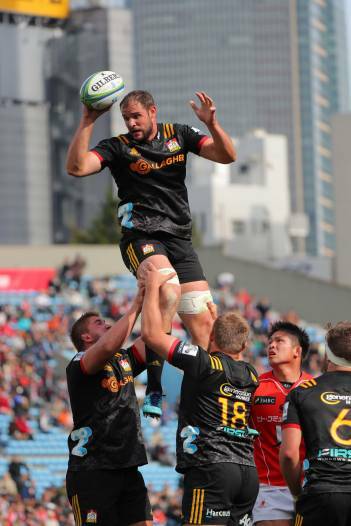 Canadian import Tyler Ardron is loving every minute in New Zealand with the Gallagher Chiefs. The 26-year old has impressed since coming into the side, showcasing dominant performances as a lock in big New Zealand derbies against the Highlanders and Blues, as well as scoring on his Investec Super Rugby debut against the Sunwolves in Tokyo. Ardron signed for the Gallagher Chiefs from Welsh club Ospreys where he played for four seasons across the European competition. The impressive Canadian has captained his national side at the 2015 Rugby World Cup, and worked alongside assistant coach Neil Barnes who was there as a specialised forwards coach. Tyler has noticed a step up in the level of rugby since coming to New Zealand, experiencing the Chiefs environment and playing Super Rugby. The Canadian also noted the passion of the fans in Chiefs country and how special it is playing at FMG Stadium Waikato. Tyler commented on feeling more and more integrated in the team and is happy with the form he’s showing. The culture of the club has resonated with the Canadian where he’s felt the connection of family strongly. “I wish I could explain the culture in words better so I could take it back to Canada because it is unreal. The emphasis you have on where you come from and your family and what actually got you here is something I’ve really connected with– all the guys here are so tight and you say good morning to everyone when you walk in in the morning which makes a big difference every day." Tyler is part of the Gallagher Chiefs travelling squad to South Africa, where the team will take on the Stormers and the Sharks. The first game of the South African tour kicks off this Sunday at 1:05am.